I remember my school days like they happened yesterday. Especially on days like the Annual Day, Sports Day, Children’s Day and Teacher’s Day when we dressed up in casuals, ditched the uniform and set off to school looking to have fun and nothing else. But that was usually it. Children’s Day celebrations were mostly restricted to the school. I don’t really remember any thing being celebrated at home around this day. Looking back, I would really have enjoyed some sort of a celebration back home. Now that I am a Mom and a crazy mom at that, I want to give my baby the best of both worlds. So apart from the obvious fun that she will have at school on children’s day when she grows up, I would definitely plan a special something for her after she is back home. As a family, we are usually down with a relaxed day at the park or a stroll around the little pond near our home. Since the husband is usually out at work and I also catch up with work while I am home, these little adventures are much treasured. But if your kids are older and are more stimulated, then there are a lot of fun things you can plan out for them to do after they are back from school. I’ll list these down for you, for reference and quick ideas. Toddlers and younger kids will totally enjoy an obstacle race designed to delay them from reaching the finishing point. Elements like lemon and spoon race, gunny bag race and three legged race can be added over an obstacle course to make the race a lot more fun! Young adults and older kids will love a good treasure hunt that is designed to test both their mental and physical strength. Also, it’s a fun and practical way to teach them things that are otherwise boring to learn at school. Is it not? Reminisce in your bournvita quiz contest days and plan a quiz if your kids are home and so are there friends. It might sound studious but throw in a couple of goofy and fun questions every once in a while to keep the laughter ringing throughout. Board games are a repleting thing. Classic board games like snakes and ladders, ludo and Chinese checkers will surely ensure some fun for the kids and major nostalgia for you. You can join in on the fun too! Nothing beats the fun that outdoor games bring. Anything outdoorsy like sprinting, hopping, gully cricket, khokho can be tried. If you are more the ‘enjoy the nature’ kind of people like we are then a laidback picnic in the park is the best gift you can give your kids. Pack their favourite snacks and drinks and some fun games to play. You are set. We are down to the most important question now. What can you gift your kids? Ofcourse you surprised them, made sure they had a memorable day but why not end it on a positive note! Gift them a bunch of happiness with the Cadbury Dairy Milk Chocolate. We have grown up with it, eaten our veggies because we were promised as kids that we would each get a Cadbury if we ate up all the broccoli. Let’s give your children something they love without a condition. Cadbury for sure! And a fun Children’s day celebration when they are least expecting it. Such a great way to celebrate Children’s Day – Chocolate is a favorite for kids and adults! Loved the ideas especially playing outside games with them. Gift of our time is the best for them. You have shared some interesting ideas to celebrate the day. What fun ways to enjoy the day with kiddos. These are great ideas. I used to go for a picnic in my childhood. Your post reminded me my time. Chocolate is the best gift its priceless for kids. Love the treasure hunt and obstacle race idea. We usually do a chocolate treasure hunt on Easter but we should do the same for childrens day. Aah a treasure hunt. The idea itself is so intriguing and mysterious. I am sure the kids will love this one. Hope you’ll had fun on Children’s Day. Treasure hunt is a really fun and cool way to spend time with the little ones! Reading this post bought back all the good old memories of school days and the fun we had. Recreating the same with our kids is the best idea. 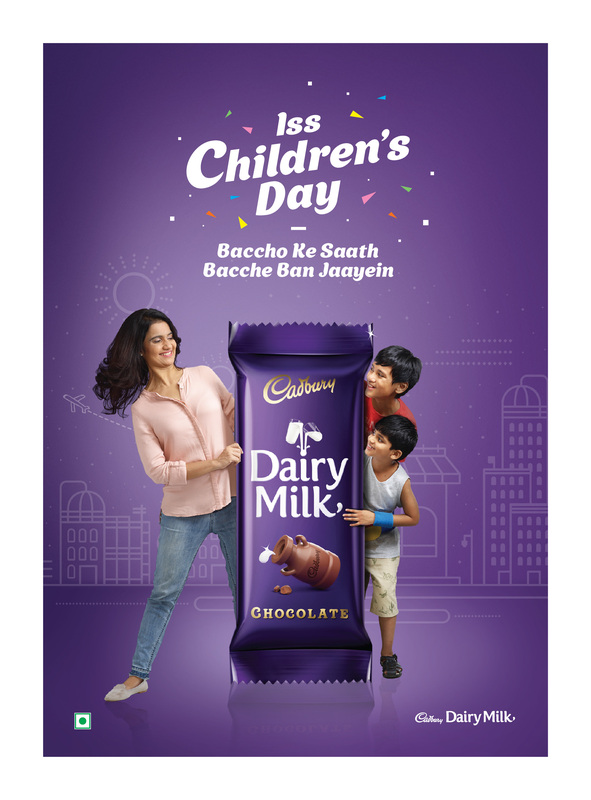 For us, no celebration is complete without a Cadbury and for kids, chocolates are like a cherry on the cake. Loved all your ideas for making children’s day special. Treasure hunt sounds like a good idea. You have listed some lovely ideas. I like gifts on utility for all occasions. The post covers nice options.